ROCKY RIVER – Defending champion and host Lutheran West repeated as title holder with a 45-30 win over Twinsburg this afternoon here in the championship match of the Eighth Annual Lutheran West SuperQuad Wrestling Tournament. West finished 5-0 while the Tigers took second at 4-1. Clearview, also with a 4-1 record, took third. In the championship match, after battling to 2-2 in the first period with Cooper Arnold, Lutheran’s Brad Watson posted the pin at 1:06 of the second period to give Lutheran a 6-0 lead after one match (130 pounds). At 135, West’s Ryan Rusnak found himself behind, 2-1, after one period to Jeremy Clark, but then took him down early in the second period to take a 3-2 lead. Clark reversed him for a 4-3 lead. Then he put him on his back for three more. Rusnak rallied at the end of the period by taking down Clark and putting him on his back, making it 7-7 going into the final period. Clark countered with a take down and near fall early in the third for a 12-7 lead. Clark picked up some more points right at the end for the 15-7 major decision, pulling his team to within two at 6-4. After going at it on his feet with Quintin Walker at 140 pounds, Corbin Schneider finally took him down later in the first period to hold a 2-0 lead for West after one period. He then broke loose on his feet in the second to take a 3-0 lead and then halfway through took down Walker and pinned him right at the halfway point (1:00). Down 12-4, Twinsburg needed some points at 145 to get back into it before facing some forfeits in the heavier weights. The Tigers’ Darion Eiland scored quickly in the first period, taking a 5-0 lead on Gevin Maxwell at 145. He kept up with the commanding rally, taking an 11-0 lead by the end of the second period. He went on to take a superior decision and narrow the team score to 12-9. Twinsburg gained the lead for the first time when Clay Hulme pinned Chance Huey in 63 seconds of the 152 match, making it a 15-12 battle. The Longhorns’ C.J. McNamee and Twinsburg’s Jared Hulme got into one of those low-scoring tangles in the 160 match. McNamee held a 2-1 lead after one and kept controlling him in the second, but Hulme kept avoiding the takedown and McNamee ran out of time. Again in the third, McNamee had him on the mat, but Hulme was able to get a reversal to tie it and then a take down for a 4-2 lead, eventually getting the decision and giving the Tigers an 18-12 lead. Topping that one in low-scoring land were West’s Andrew Liese and Twinsburg’s Jae Hamilton at 171. They went through two periods in a scoreless bout until Liese picked up a point. Hamilton took down Liese with 30 seconds left to take the lead for a couple seconds but then Liese escaped to tie it, 2-2. In overtime, neither could get a grip to do anything to muster and edge, sending it into a second overtime. Still tied 2-2 after two overtimes, Liese took the lower spot to start the third OT and promptly got up and escaped for the point to take a 3-2 win. The three-point deficit was then turned into a 21-point lead for West as the Tigers forfeited the three highest weight divisions and 103, but then West forfeited 112 and 119. Izaak Zmich pinned Mark Holzworth in the final match at 125 to give Lutheran a 45-30 win. Kurt Guelker (189) was one of three Lutheran West wrestlers who went 5-0 on the day. Bryce Deblock (103) and Watson were the other two. After two rounds of dual competition, there was already a couple clear leaders with host Lutheran West holding a 2-0 record along with Twinburg. Lincoln-West, Clearview, West G. and Elyria Catholic maintained 1-1 records after two rounds. A key team dual came in the second round with the Longhorns sneaking out at the end with a forfeit at 103 pounds to take a 39-36 win over Elyria Catholic. Frank Sanabria won by decision at 215, 11-6, to pull the Panthers to within three at 33-30 and then Dave Smith won by a pin to give EC a brief 36-33 lead until the forfeit at 103 became official, giving the Horns the final six points. The best first round battle was between Twinsburg and Clearview with the Tigers coming out on top, 42-41, and then Twinsburg went on to beat Brooklyn in the second round, 41-12. The Horns kept half the lead through three rounds with a 55-17 win over Chagrin Falls, which fell to 0-3 after three. So in three matches, the Horns had scored 48, 39 and 55 points. EC kept pace with a 44-24 win over West G. and Clearview clubbed fellow PAC-10 foe Brooklyn, 63-29 to move to 2-1. Twinsburg dropped Lincoln-West, 54-30, into third pace and maintained its share of the team lead and had totaled 137 team points, four points behind Lutheran. In fourth-round action, a couple tight battles had Clearview knock EC down to fourth place with a 42-39 win and Chagrin garner its first win with a 36-30 downing of Brooklyn. The Longhorns maintained part of the lead going into the fifth and final round of duals with another convincing win, 60-24, over Lincoln West. At 4-0, Lutheran assured itself of at least a tie for first place with total points serving as the tie breaker. The longest and tightest team battle came in the Twinsburg-West G. match-up in fourth-round play. West. G, a Division II school, brought its JV team to this tournament since most of the other teams were Div. III, IV or V. The varsity was at the Aurora tournament, where coaches would not allow freshmen to compete so any frosh wrestling for the Wolverines was here today. The fourth-round matches started with the 125-pound match. Twinsburg and West. G traded off with close battles that resulted in mostly regular decisions in the first seven matches. Tied 6-6, Twinsburg took a 9-6 lead when Jeremy Clark took a decision from Mike Cline at 135 to give Twinsburg a 9-6 lead. Qutintin Walker followed with a 13-9 win at 140 over Justin Palchik to make it 12-6 and than Darian Eiland was a 13-10 winner at 145 over Andrew Cntrackio to make it 15-6. Then arrived the huge match-up at 152 between West G.’s Dave Eippert and Twinsburg’s Caly Hulme. Both came into the match undefeated on the afternoon. Hulme held a 3-2 lead going into the final period when Eippert came back to take a 5-3 win and make it a 15-9 affair. At 160, Jared Hulme and Dan November were tied 5-5 in the third period, but then “Mr. 11th Month” came up with the pin for the Wolverines to tie it in the team score, 15-15. A Jae Hamilton pin followed by a forfeit gave Twinsburg a 27-15 lead. West G made it 27-21 on a forfeit and a series of double forfeits left it that way at the end, setting up the championship match between West and Twinsburg, both clubs going into the fifth dual at 4-0. West G. (2-2) closed out with a 33-22 win over Brooklyn (0-5). Clearview closed out with a 70-24 win over Chagrin (1-4) and Elyria Catholic (3-2) with a 66-12 win over Lincoln-West (1-4). WESTERVILLE, Ohio -- Amanda Rose (Uniontown/Green) scored 17 points, leading a quintet of scorers in double-figures, as the nationally-ranked Mount Union's women's basketball team rallied from a nine-point halftime deficit to defeat Otterbein, 68-64, in an Ohio Athletic Conference opener today. Trailing 29-20 at halftime, the Purple Raiders opened the second half with 13 consecutive points. Rose scored five points during the run and Brittany Kilgore (Northfield/Nordonia) put in four. Kori Wiedt (North Olmsted/North Olmsted) and Rosa LaMattina (Westlake/Westlake) made baskets to close the run, which gave Mount Union a 33-29 lead with 17:03 left. ATHENS, Ohio - Two key cogs from Ohio soccer's defense garnered 2010 All-Mid-American Conference recognition as senior defender Sarah Brown was named to the All-MAC First Team and freshman goalkeeper Mattie Liston was named to the All-MAC Freshman Team, the league office announced Friday. Brown's selection marks the 23rd All-MAC honor under head coach Stacy Strauss, a Bay Village native, while Liston's is the eighth All-MAC Freshman selection, which began in 2003. The duo played vital roles in helping the `Cats boast one of the strongest defenses in the MAC this season. The Green and White gave up just 21 goals on the season, equaling the lowest total in program history. Ohio ranked fourth in the MAC in both goals allowed and goals against average (GAA). A Communications major and Academic All-MAC honoree last year, Brown (North Royalton, Ohio) helped anchor Ohio's backline throughout the year, helping the team to six shutouts on the year and helping hold opponents to under 10 shots a contest. Her speed, athleticism and ability on the ball helped the `Cats hold the conference's two highest scoring teams, Miami and Western Michigan, to just a goal each while holding each well below their season averages for shots per game. Brown finished the season with five shots, including two on goal. She scored the only goal of her career in last season's MAC Tournament against Toledo. Liston (Lakewood, Ohio) made a splash during her rookie season with Ohio. While also starting and playing every minute of the season for the Green and White, she was part of a `Cat defense that ranked among the best in the MAC. The Lakewood, Ohio, finished the season with 92 saves, the second-highest single-season total in school history and third best in the MAC this season. She also had a GAA of 1.03, the program's fourth-best mark for a season. In addition, Liston totaled six shutouts, already ranking her in the top five all-time in program history, and had a save percentage of .814. Ohio recently completed its 2010 season with a 6-9-4 mark overall, while finishing third in the MAC East. The `Cats fell to conference champion Toledo in the first round of the MAC Tournament. CANTON – St Edward won the school’s first football and 41st overall team state championship with four touchdowns in the final 14 minutes of the game for a 35-28 win over Wayne in front of 9,316 fans tonight here in Fawcett Stadium. Wayne’s offense did not touch the ball until there was 3:28 left in the quarter. The Eagles staged a 16-play, 8-and-a-half-minute drive to start off the game. The drive was capped by a 1-yard TD run by Reggie Terrell, who ran over Tyler Orlosky and Kyle Kalis to get into the end zone. The Eagles got on the nerves of the Warriors first drawing them off sides while in punt formation to get a first down and then making their offense itch more on the sidelines after the defense put on a stop with a tackle for loss but did the facemask deed ont the tackle, initiating a new set of downs. Wayne tied it with a score as the first quarter ended. The special teams turned in a big play when punter Chris Cameron nailed a coffin corner punt at the Wayne eight-yard line with just over four minutes to go in the half. It appeared to be almost enough time for Wayne though. The Warriors drove into the red zone one a long gain, but it was nullified and brought back because of a penalty, sending the ball all the way back to the Wayne 31. The defense finally put a stop on the quasi-threat when Sam Martello turned in a tackle for loss. 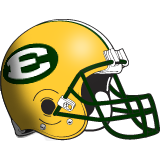 St. Ed put together its only first half scoring drive mainly on the ground with Reggie Terrell, Terrell Bates and Kevin Burke doing most of the running. Fullback Ryan Giachetti did pick up a first down on an interior run. Both Burke and Bates ran for more than 30 yards and Burke threw for over 30 in the first half. Colin McManamon caught one pass to give him at least one in 14 of 15 games this season. St. Ed managed only 85 yards of total offense in the fist half and yielded 132 on defense but has the handle on the time of possession battle by five minutes. Mike DiNunzio’s PAT was his 66th in 68 tries this season. Wayne took a 14-7 lead with its first possession of the second half, coming at 9:57. The Warriors took a 21-7 lead midway through the third period, but St. Ed got one back when Burke threw 10 yards to Pat Berry on a fourth-down play for a TD with 2:27 to go in the third. In the drive, Burke threw to Quincy Jones for a first down then ran for 28 to take the ball down to the 30. That was followed by a big defensive series with Avery Bailey intercepting a pass and taking it into the Red Zone at the Wayne 18. Two plays later Bates ran into the end zone on a 15-yard run. DiNunzio connected on his 67th PAT on the season and it was a brand new game, 21-21, with 1:32 to go in the third. After the St. Ed defense held, Kevin Burke set up the go-ahead TD with a 59-yard run into the Red Zone and then scrambled in for a six-yard TD with 9:53 to play. DiNunzio’s PAT was taken away when St. Ed was called for holding and his second attempt from 34 yards just narrowly missed, leaving the score, 27-21. Wayne ate up seven minutes to take the lead, 28-27, but the Eagles bounced right back. Burke threw for an 18-yard gain to Quincy Jones at the 29 in near field-goal range. Then he threw 12 yards to McManamon. Then Bates ran it in from the 17 with 1:32 to play. Burke connected with Jones for the two-point conversion to make it 35-28. On the final Wayne series of the game, Deonte Gibson turnd in a big play, sacking the quarterback for an 11-yard loss. On fourth and 20, Bill Lally put the quarterback hurry on and Cory Blacktock intercepted. ALLIANCE, Ohio -- Senior wide receiver Cecil Shorts III (Cleveland/Collinwood) made nine catches for 115 yards and one touchdown as the second-ranked Mount Union football team advanced to the NCAA Semifinals for a 16th straight season, claiming a 37-7 victory over Alfred (N.Y.) in an NCAA quarterfinal on Saturday at Mount Union Stadium. Mount Union (13-0) will take on 14th-ranked Bethel (Minn.), a 12-7 winner over No. 4 St. Thomas (Minn.), next Saturday at noon in Alliance. Sophomore running back Jeremy Murray (Martins Ferry/Martins Ferry) had 33 rushes for 122 yards and a touchdown while sophomore quarterback Neal Seaman (Louisville/Louisville) completed 20 of 36 passes for 241 yards and one touchdown. BEREA -- The Baldwin-Wallace College wrestling team finished fourth of nine teams competing today (Saturday, December 4, 2010) at the annual Rochester Institute of Technology Tournament in Rochester, New York. The Yellow Jackets had 94 total points and were led by senior 174-pounder Andrew Scavuzzo (Cuyahoga Falls/ Woodridge), senior 197-pounder Tristan Stoll (Milan/Edison), junior 285-pounder Ryan Jones (Uniontown/Lake), sophomore 165-pounder Joe Georgian (Eastlake/Villa Angela-St. Joseph), freshman 125-pounder Andrew Taylor (Columbus/Worthington Kilbourne), Korey Leonhard (Kinsman/Pymatuning Valley) and junior 125-pounder Jeremy Dombrady (Copley). 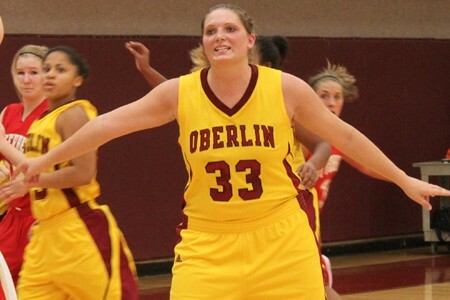 Oberlin, Ohio – Behind a gutsy effort from Allison Anderson and all-around great performances by Syrea Thomas and Ellen Neumann, the Oberlin College women’s basketball team was able to outlast the visiting Tartans of Carnegie Mellon 65-58 this afternoon. Anderson, who was not feeling 100 percent due to illness, toughed it out to score a game-high 22 points to go along with eight rebounds, seven assists and just one turnover. Most of her damage came at the charity stripe where she went 12-of-13. BEREA, OHIO -- Junior forward Kevin Knab scored 22 points as the Marietta College men’s basketball team defeated Ohio Athletic Conference rival Baldwin-Wallace College, 83-61, today (Saturday, December 4, 2010) on Fenton Court in the Ban Johnson Fieldhouse in Marietta, Ohio. With its win, Marietta improved to 6-0 overall and 2-0 in the OAC. 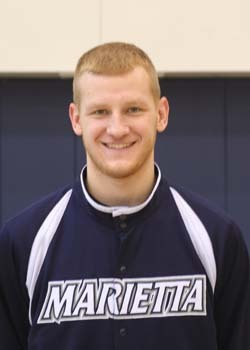 In addition to Knab for Marietta, junior guard Trevor Halter had 18 points. For B-W, now 2-4 overall and 1-1 in the OAC, freshman guard Kevin Krakowiak (Valley City/ Holy Name) led the way with a career-high 15 points and sophomore forward Chris Ameen (Broadview Heights/ Walsh Jesuit) had 11.